Lactobacillus rhamnosus is a facultative, lactic acid bacterium in the phylum Firmicutes. Lactobacillus spp. are generally considered beneficial, and specific strains of L. rhamnosus are validated probiotics. We describe the draft genomes of three L. rhamnosus strains (L31, L34, and L35) isolated from the feces of Thai breastfed infants, which exhibit anti-inflammatory properties in vitro. The three genomes range between 2.8 – 2.9 Mb, and contain approximately 2,700 protein coding genes. Within the phylum Firmicutes, the family Lactobacillaceae contains three genera: Lactobacillus, Paralactobacillus, and Pediococcus; Lactobacillus being the largest with latest estimates ranging between 227-230 species (Web Site) . Members of Lactobacillus are gram-positive, non-motile, anaerobic, lactic-acid-producing bacilli that are divided into three fermentation groups: A) obligately homofermentative, B) facultatively heterofermentative, and C) obligately heterofermentative . 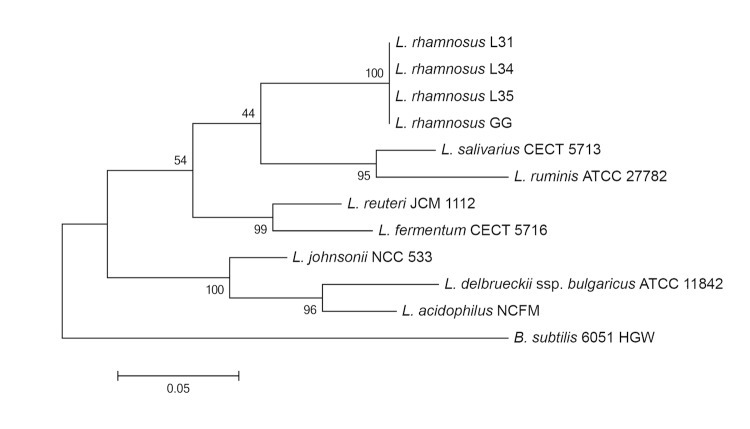 L. rhamnosus resides in fermentation group B and is distinct from the three major Lactobacillus phylogenetic groups based on 16S rRNA gene sequence (L. delbrueckii, L. reuteri, and L. salivarius groups) . 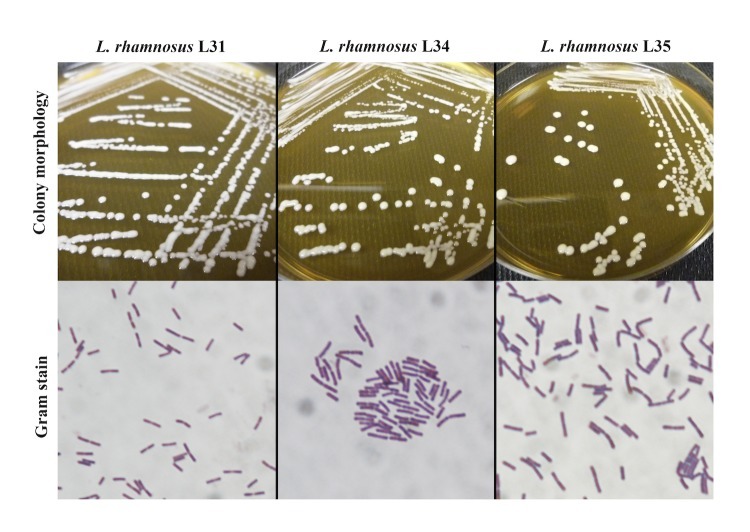 L. rhamnosus strains L31, L34, and L35 are phylogenetically similar to L. rhamnosus GG and maintain a distinctive 16S rRNA gene-based phyologeny from the three major Lactobacillus groups (Figure 1). The basic characteristics of L. rhamnosus L31, L34, and L35 are summarized in Table 1.
a) Evidence codes – IDA: Inferred from Direct Assay; TAS: Traceable Author Statement (i.e., a direct report exists in the literature); NAS: Non-traceable Author Statement (i.e., not directly observed for the living, isolated sample, but based on a generally accepted property for the species, or anecdotal evidence). These evidence codes are from the Gene Ontology project . L. rhamnosus strains L31, L34, and L35 were routinely cultured in an anaerobic chamber (Concept Plus, Ruskinn Technology, UK) (10% CO2, 10% H2, and 80% N2) for 24-48 h at 37°C in de Man, Rogosa, Sharpe (MRS) medium (Oxoid, England). For genomic DNA isolation, cultures were adjusted to an OD600 of 0.1 and incubated anaerobically at 37°C for 8 h. Bacterial pellets were collected by centrifugation and the DNA was extracted using QIAGEN Genomic-tip100/G columns (Qiagen, Germany) according to the manufacturer’s instructions. DNA quality was analyzed by agarose gel electrophoresis, and concentrations were determined by fluorescence using the Qubit™ DNA Assay (Life Technologies, USA). The beneficial effects of human-intestinal derived L. rhamnosus GG have been studied for two decades [42-45] and its complete genome is available in NCBI . We have compared the draft genome sequences of the potential probiotic L. rhamnosus strains L31, L34, and L35 to L. rhamnosus GG. The L. rhamnosus GG genome (3,010,111 bp, 46.69% GC content) is slightly larger than the new genomes presented here, and has approximately the same GC content (Table 3). In a recent comparative genomics study of 100 L. rhamnosus strains, Douillard, et al. delineated seventeen variable chromosomal regions of L. rhamnosus strain GG (annotated in Figure 3), and the majority of these regions are absent or incomplete in the genomes of strains L31, L34, and L35 (Figure 3), notably the spaCBA pili gene cluster required for mucus adhesion . The galactitol PTS region important for dulcitol utilization, a trait that typically belongs to L. rhamnosus isolates adapted to the intestinal tract , is conserved in L31, L34, and L35. Similar to L. rhamnosus GG, L31, L34, and L35 each contain genes annotated as L-lactate dehydrogenase (ldhL) and D-lactate dehydrogenase (ldhD) important for synthesizing L-lactate and D-lactate from pyruvate, respectively . L. rhamnosus GG is unable to metabolize either maltose due to an inserted gene between the maltose-specific transport genes and hydrolase, or lactose because of a 38 bp N-terminal truncation in lacT and a disrupted lacG [47,50]. Strains L31, L34, and L35 all have an intact maltose locus and carry non-mutated copies of lacT and lacG (locations indicated on Figure 3), and therefore are predicted to utilize both maltose and lactose. 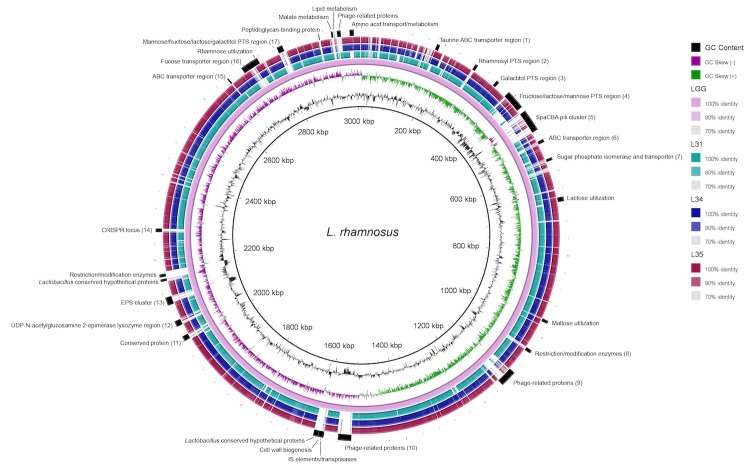 Circular representation of 3 draft L. rhamnosus genomes compared against L. rhamnosus strain GG (NC_ 013198). The innermost rings show GC content (black) and GC skew (purple/green). The remaining rings show BLASTn results of each genome against L. rhamnosus GG with results rendered using the BRIG program . Relative shading density (from darker to lighter) within each circle represents levels of nucleotide homology. Blank regions represent absent genetic regions. Genetic regions of interest are annotated on the outermost ring. Numbered elements (1-17) represent the previously identified variable chromosomal regions of L. rhamnosus GG . Spinler JK. Human Microbiome, Lactobacillaceae in the. In: Nelson K, editor. Encyclopedia of Metagenomics. Verlag Berlin Heidelberg: Springer; 2013. Schleifer KH. Family I. Lactobacillaceae Winslow, Broadhurst, Buchanan, Krumwiede, Rogers and Smith 1917, familia. In: De Vos PG, G.M. ; Jones, D.; Krieg, N.R. ; Ludwig, W.; Rainey, F.A. ; Schleifer, K.H. ; Whitman, W.B., editor. Bergey's Manual of Systematic Bacteriology, Volume Three The Firmicutes 2nd ed. Volume 3, The Firmicutes. New York: Springer; 2009. p 465-532. Jittaprasatsin C. Quantification and determination of antagonistic activity of bifidobacteria and lactobacilli in faeces of breast-fed and mixed-fed infants. Bangkok,Thailand: Chulalongkorn University; 2008. 113 p.
Garrity G, Holt J. The Road Map to the Manual. Bergey's Manual of Systematic Bacteriology. Volume 1. New York: Springer; 2001. p 119-169. Rogosa M. Genus Lactobacillus Beijerinck 1901, 212; Nom. cons. Opin. 38, Jud. Comm. 1971, 104. In: Buchanan RE, Gibbons NE (eds), Bergey's Manual of Determinative Bacteriology, Eighth Edition, The Williams and Wilkins Co., Baltimore, 1974, p. 576-593. Boonma P. Role of Lactobacillus in the suppression of Clostridium difficile-induced IL-8 production in colonic epithelial cells. Bangkok,Thailand: Chulalongkorn University; 2013. 120 p.